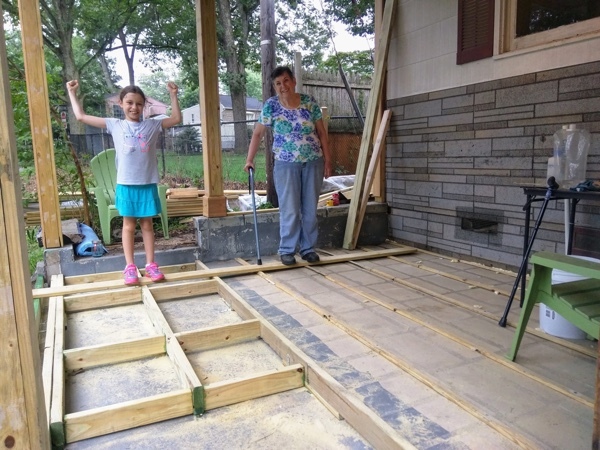 Unfortunately, we used up most of my parents’ stay before we got around to doing the deck, so we didn’t get to finish before they left. They got to see it almost done though. I spent most of the day finishing up the details. Angle brackets that needed extra concrete screws in them and blocking to keep things from wiggling. I also painted copper wood preservative over every cut end before fastening it in place. 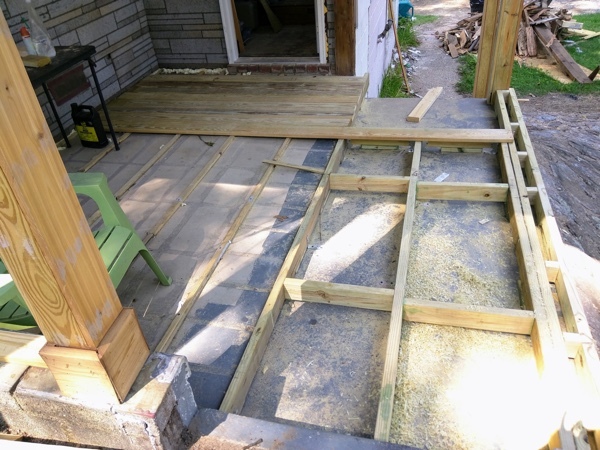 In addition to concrete anchors, 3″ galvanized nails, plentiful brackets, and tons of decking screws, we ended up using big blops of adhesive (not a continuous line that might trap water) every couple feet underneath each and every strip, shim, and board. 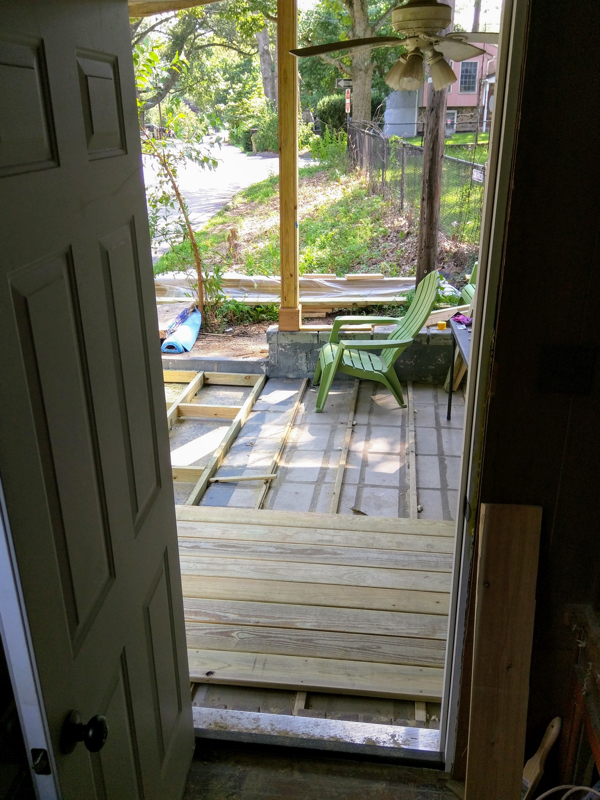 This porch is pretty darn solid! 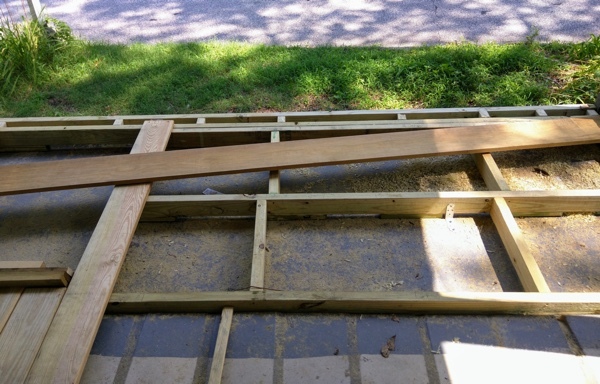 Right before we left my dad screwed down the very first board and we laid some more down next to it so he could see what it would look like. I’m sad he won’t get to stand on the thing he worked so hard for. Starting to get to the exciting part! This entry was posted on Saturday, August 12th, 2017 at 4:54 pm	and is filed under rehab. You can follow any responses to this entry through the RSS 2.0 feed. You can leave a response, or trackback from your own site. OMG, you are just amazing!!!! Well, more than just amazing! I can think of more words, but some might think I am swearing! I have loved, loved, loved, reading about this huge project! OMG!!!!! Now, I realize it was a good thing that David was gone for part of the time your parents were here, we would have kept you guys from getting some amazing things done on your beach house! I sure do know the best person to call when we are stumped or just want to learn how to do rehab! You are just an incredibly talented woman (well, I really did know that already, but now!!!!!). Love, love, love this project and will keep reading! Atom, Entries (RSS .92), (RSS 2.0) and Comments (RSS 2.0). 29 queries. 0.249 seconds. Top.